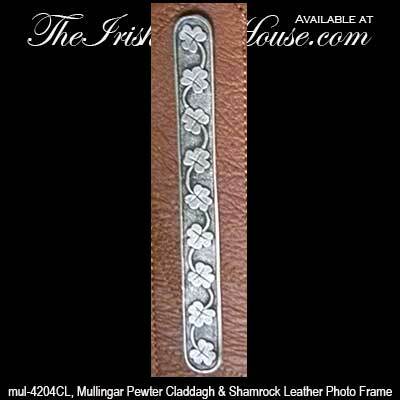 This Irish picture frame features pewter Claddagh and shamrocks that are surrounded with leather. 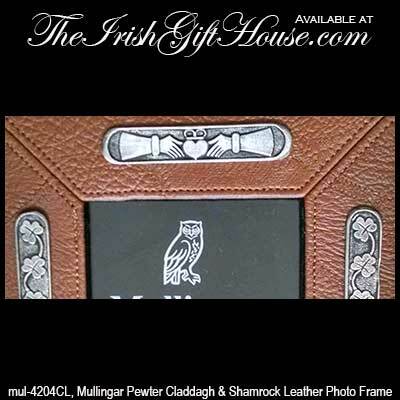 The leather picture frame features a pewter Claddagh across the top along with pewter shamrocks on each side. The Irish picture frame measures 6 1/2" wide x 8 1/2" tall and it holds a 4" x 6" photo (the actual opening measures 3 1/2" wide x 5 1/2" tall). 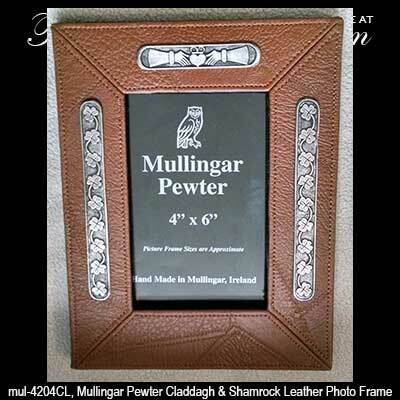 This Claddagh picture frame has an attached easel for standing and it is made in Ireland by Mullingar Pewter. The Irish photo frame is gift boxed with Claddagh and shamrock history cards that are complements of The Irish Gift House.